The 4th Edition of The Connection is now available. COMPLETE THE FORM BELOW TO DOWNLOAD THE PDF! 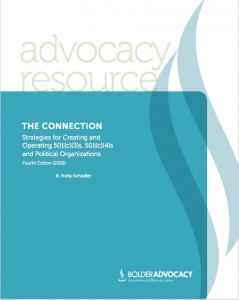 Since it was first published in 1998, The Connection has provided nonprofits with guidance on how they can engage with the public, lawmakers, and candidates to affect public policy, and how these organizations can coordinate together, even in an election year. This guide focuses on the role c4 organizations play in our democracy—as stand-alone organizations but also in conjunction with affiliated c3s and with political organizations (PACs). The 2019-2020 cycle federal contribution limits have been released, and reflect increased limits due to inflation. of these contributors, the report must specify which contributed over $200 overall for the purpose of furthering any IE. Electronic filers should use a memo text entry to provide this information. Paper filers may add this information next to the applicable transaction on Schedule 5-A. A “contribution” includes any gift, subscription, loan, advance, or deposit of money or anything of value made by any person for the purpose of influencing any election for federal office. So, the group does not have to report all of the donations it has received, but it will have to determine which receipts meet this description. Without further FEC or judicial guidance, a group should consider, at a minimum, as to each receipt (i) the language and context of its solicitation, (ii) the donor’s expressed intent, and (iii) any other factors that may bear on identifying the purposes of the donation. The FEC issued guidance on disclosure of contributors and the standards for quarterly reports due from all groups that are not FEC-registered political committees when they make federal independent expenditures aggregating over $250 during the quarterly reporting period. This FEC guidance describes what information about donors is expected in order to comply with the U.S. District Court’s August 3 ruling in CREW v. FEC, which invalidated the longstanding FEC regulation that required groups to report only contributions they received whose purpose was to support their particular reported independent expenditures. Hear about the latest in nonprofit and foundations news, interviews with funders, announcements about new resources and upcoming workshops, and policy updates affecting tax-exempt organizations. The BA Digest is designed to inform and inspire your policy change work!